Following ESC UKAS-accredited certification for Functional Safety Capability the article ‘Competence key to safety solutions’ has been published in the Industrial Compliance Magazine, a magazine dedicated to the standards, legislation and directives applicable in today’s industrial environment. Full article from IC Magazine below. An engineering consultancy is urging businesses working in hazardous environments to challenge the credentials of companies offering functional safety solutions, for added peace of mind that the measures being proposed, and the personnel advising on them, are fit for purpose. London-based Engineering Safety Consultants (ESC) works in upstream/downstream oil & gas as well as power, process chemical, military and bio-containment facilities, playing a crucial role in not only supplying solutions and consultancy to protect operations in the manufacturing and processing sectors, but also helping to set international safety standards. 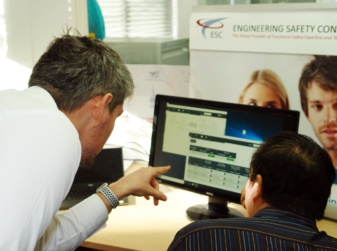 The company recently joined a very select few organisations to complete an audit by UKAS-accredited body Sira Certification Service, achieving certification in both IEC 61508 and IEC 61511: functional safety standards that Managing Director, Simon Burwood, says makes ESC stand out from its competitors. In addition to their ‘day job’ managing ESC, Simon Burwood and Chairman Ken Simpson, along with several of their company colleagues, sit on the International IEC 61508 and IEC 61511 Maintenance Committees and have been using their extensive expertise to help develop the latest global standards for functional safety. Ensuring that safety standards are being met can be challenging for any business operating in a hazardous environment, which is why competence is vital in all aspects of functional safety projects. Practising what it preaches, ESC knew it would reassure customers and set the company apart from competitors if the capability of its functional safety management system and people was independently audited and certified by a third party. This latest achievement compliments the company’s other accreditations including ISO9001 and ISO14001, ISO 18001 for Occupational Health & Safety and environmental systems qualified through Achilles UVDB. In addition to its London headquarters, ESC also has offices in Warrington, Humberside and Abu Dhabi, providing functional safety solutions, consultancy, workshops and training to help companies in the oil and gas, petrochemical, power generation, manufacturing and other sectors improve the management of their safety and maintenance systems to comply with international standards. The company has become an upwardly mobile force and its expertise in functional safety is often called upon to present at commercial events and conferences around the world, in addition to running its own seminars and training courses.